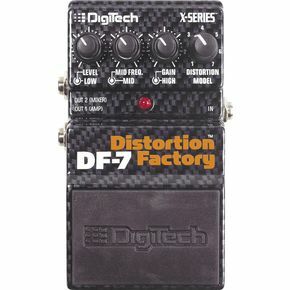 The Distortion Factory (DF-7) pedal by Digitech is part of their new offering of X-Series modeling stompboxes, combining simple stomp box design with tonal options usually found in more expensive modeling designs. The DF-7 comes in a sturdy metal box, with somewhat of an 80s style silver snake pattern on black. The pedal has one ¼ inch input on the right and two ¼ inch outputs on its left. In the default setup the output 1 can feed an amplifier while output 2 is a speaker emulated output either for a mixer or a recording device. The pedal is powered via one 9 volt battery, housed under the rubber padded on/off switch. It can also be powered by a 9 volt adapter (Digitech part # PS200, not supplied). According to Digitech battery life is 6 hrs which definitely makes a case for having an adapter as this puppy definitely drains them fast! The battery can be swapped by spring loaded hinges that release the top part by pressing either side of the pins with a ¼ jack socket. The battery is easy to replace and a ¼ inch jack is something musicians will always have handy. The Distortion Factory has the following controls – LEVEL, LOW, MID FREQ, MID, GAIN, HIGH, Distortion Model. The pedal is illuminated by a red LED when active. The DF-7 provides a myriad of tonal options which initially can be a bit intimidating. The heart of this unit is the X-Series distortion modeling which gives you access to seven distinct distortion sounds. The distortion models are based upon popular models by Digitech and other stomp box makers. The DF-7 also has a very versatile eq section, with parametric eq on the mids which allows for further tone control and sound tailoring. Models 1 to 4 are more on the lighter side, and they can be used in combination with a overdriven amp to push the gain further. If you run them in front of a clean amp you can also get bluesy or hard rock sounds that come very close to the pedals being emulated. Models 5 to 7 go more into meltdown territory and can be used for metal or smoldering lead sounds. While testing this pedal I found myself drawn to the MT-2 emulation (distortion #5). This distortion setting can easily achieve screaming sustain leads and a focused metal sounds. The Rat emulation (#4) sounded a little dull and lacked some of the original's bite and transparency. Unlike the original, however the DF-7 had the extra eq options which let me get a more focused lead sounds with it. I personally would've been happier if Digitech included some other emulations instead of the SD-1, Metal Master or Big Muff, as these seemed harder to get a sound that I was happy with. After some tweaking I was rewarded with some usable lead sounds but it definitely wasn't something I'd consider using for a long time. The output section of this pedal has very flexible routing options, usually not found in stomp boxes of this size. The player can use amp out (output 1) to feed an amp and output 2 to feed a mixer or recording device. Alternately output 2 can be assigned as an amplifier output as well, which can then feed two amps in stereo configuration. As another option the player can also assign output 1 as an amp simulation thus getting a stereo feed to a mixer or recording device. The speaker emulation is also active when the pedal is not engaged, so in essence another overdrive or distortion unit can use the amp simulation for direct recording as well. These routing options can come in very handy when one wants to travel light or is on a budget and needs a device to plug in a guitar for recording. Overall the DF-7 is a very flexible pedal for players that need more than one sound, for either recording or live work, or for players that are not sure what will work for them. There is lots of room for experimentation on this unit and plenty of useful studio and live sounds to keep guitarists happy for a long time.